"Sing with the joy of the holiday!" 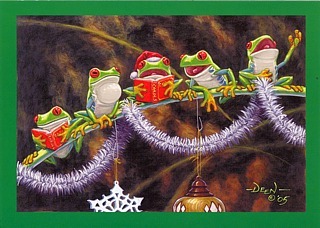 That's the message inside this fantastic frog Christmas card, featuring five red-eyed treefrogs singing Christmas carols. Two are holding books of carols, while the others sing along.  They are perched on a branch festooned with garland and ornaments. Inside, a bullfrog wearing a Santa hat bellows forth his song while a tiny frog watches in awe (see lower photo, below). The cards come with fancy gold-foil lined envelopes. The drawing is by talented young artist David Deen. Size: Cards are 5" x 7". 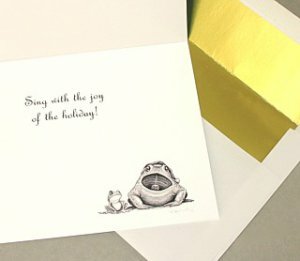 You get a package of 10 frog Christmas cards and 10 white foil-lined envelopes.